The 11 1/2" X 20" Red and White brushed tricot with yarn ball Santa Cap in the minimum of 250 without a custom imprint is only $ .48 each. 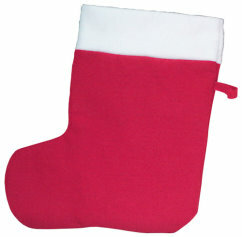 The 11" X 12" Red and White acrylic felt Santa stocking in the 250 minimum is also only $ .48 each. Available for immediate shipping. 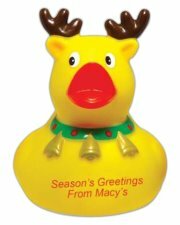 Pictured below are three of our most popular Holiday rubber ducks. 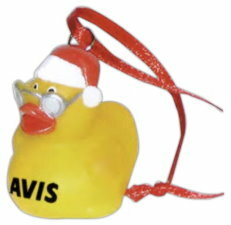 The Santa duck on the left measures 3 1/2" and the Reindeer duck on the right also is the same size. Each of these two ducks provide a custom imprint area of 1" X 1/2". In the minimum imprintable quantity of 150 they are $ 2.17 each. 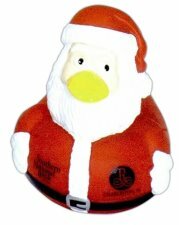 The Santa Claus rubber duck in the middle picture is 3" X 3 1/4" and has an imprintable area of 3/4" X 1/2". It has a minimum imprintable quantity of only 50 and is $ 2.98 each in the minimum quantity of 50. 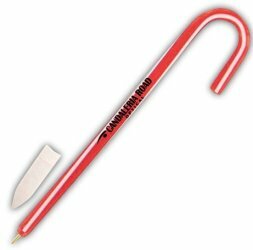 The Candy Cane pen is a great way to say "Thank You" to customers without spending a lot of money. It provides an imprint area of 1 3/4" X 5/8" on the barrel and in the minimum imprintable quantity of 150 is only $ .65 each. 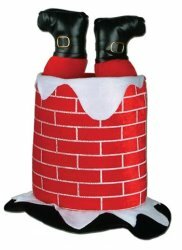 The Santa and Snowman Towels measure is 13" X 13 1/2" and they are eco-friendly and made from lead free print and are formaldehyde free. Your custom imprint appears on the 11" X 1 3/4" best area. In the minimum of 100 they are $ 5.90 each. Kids can just peel off the stickers and put the clothes on Santa. 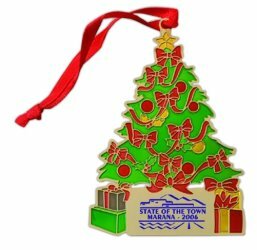 The overall size is 3 1/4" X 7" and the top area provides an imprint area of 1/2" X 2 3/4" With your one color imprint in the minimum of 250 they are $ .70 each. 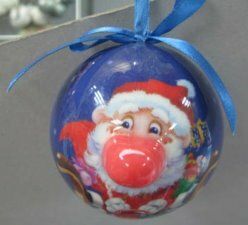 The 3" diameter stock shatterproof Santa ornament lights up and plays music. In the minimum of 500 they are $ 2.06 each. 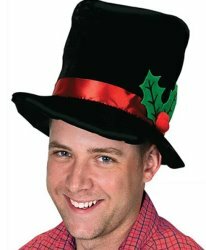 Our Red Felt Santa Hat (non-imprinted) in the 150 minimum is only $ 2.22 each and is our most popular hat for all sorts of parties, conventions and affairs. This Felt Santa hat (non-imprinted) complete with a beard and is ready to go! In the minimum order is 72 they are only $ 3.22 each. 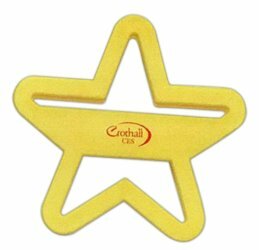 Our Star and Tree cookie cutters measure 3 1/2" X 3 3/4" and provide a custom imprint area of 1/2" X 1 1/2". In the minium custom imprintable order of 150 they are $ .89 each. 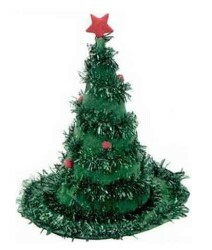 Our Christmas Garland Tree Hat (non-imprinted) has a minimum of 72 and they are $ 7.74 each. This is a truly unique Holiday hat and can make you the life of the party. 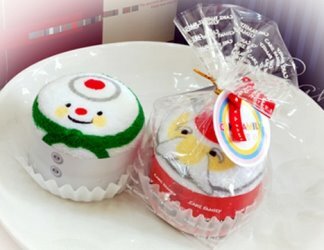 On the left the Plush Santa Hat with the Santa Face has a minimum of 72 and the price is $ 5.82 each. In the middle the Red & White Velvet Hat with Sequins also has a minimum of 72 and the price is $ 5,28 each. On the far right the Red Sequin Santa Hat has a minimum of 72 and they are $ 2.76 each.Pricing is for non-imprinted. 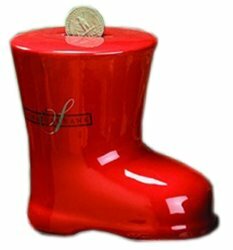 The Santa Ceramic Boot Bank provides an imprintable are of 1" X 1 3/4" and in the minimum of 72 is $ 5.25 each. Great product for Christmas Savings clubs! 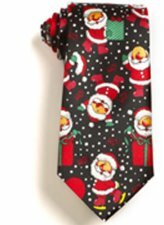 The 3 7/8" wide X 58" Santa neckties are a stock item and in the minimum of 12 they are only $ 12 each. They are not custom imprintable. On the left we have the Christmas 3 Point Jester Velvet with Plush and in the minimum order of 72 the price is $ 6.44 each. 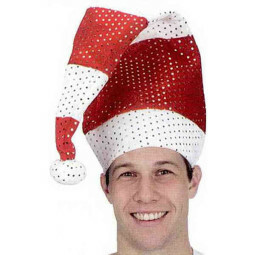 Next is the Felt Santa Hat with Bells and in the minimum of 72 are $ 1.68 each. 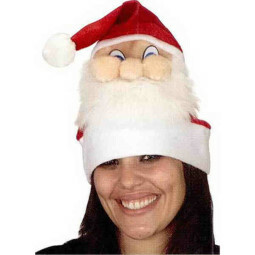 Next is the Felt Santa Hat and in the minimum of 72 is $ 1.16 each. On the far right is the Felt Elf Hat with price being $ 5.25 each in the minimum quantity of 72. Pricing is for non imprinted. 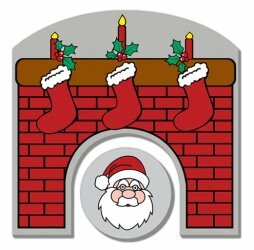 The Santa Claus Hat (Polyester) on the left in the minimum quantity of 72 is $ 7.82 each. 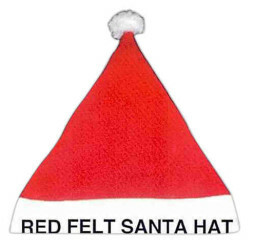 Next is the Deluxe Felt Santa Hat in the minimum quantity of 72 is $6.62 each. 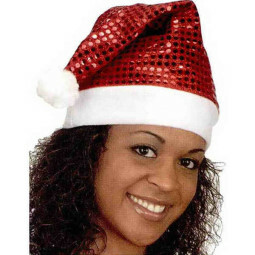 Next is the Velvet Santa Hat in the minimum quantity of 72 the price is $ 4.84 each. On the far right is the Red Metallic Santa Hat in the minimum quantity of 72 is $ 4.04 each.Pricing is for non-imprinted. 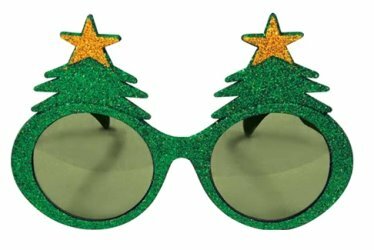 The Light-up Red/Green Felt Elf Hat in the minimum quantity of 72 is $ 13.88 each, The Green Felt Elf Hat in the minimum quantity of 72 is $ 4.52 each. Next is the Christmas Cap (Polyester) in the minimum of 72 is $ 3.76 each.In the picture on the far right is the Plush Santa Hat in the minimum of 72 is $ 3.22 each. Pricing is for non-imprinted. The left picture is the Felt Elf Hat with Ears and in the minimum quantity of 72 is $ 7.74 each. The Red Christmas Velvet Hat with White Trim in the minimum quantity of 72 is $ 13.54 each. 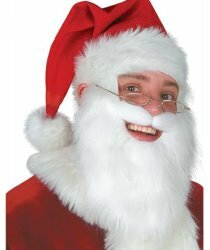 Next is the Santa Beard and in the minimum quantity of 72 they are $ 2.90 each. Picture on the right is the Deluxe Plush Santa Hat in the minimum quantity of 72 is $ 5.96 each.Pricing is for non-imprinted. Left picture is the Plush Reindeer Antlers in the minimum quantity of 72 is $ 9.68 each. Next the Felt Reindeer Antlers in the minimum of 72 is $ 5.64 each. On the far right is the Santa Felt Antlers with Plush Hat in the minimum quantity of 72 is $ 2.90 each .Pricing is for non- imprinted products. 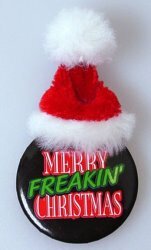 This stock 1 1/2" Christmas button with Santa Hat in the minimum of 72 is $ 1.58 each. We can also do custom imprinted buttons of various sizes and shapes. Give us a call at 800 960-9080 for more information. 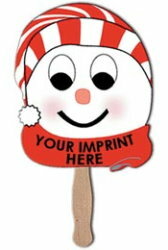 The 5 1/2" Candy Cane in a cello wrapper provides an imprintable area of 2 3/4" X 3/16". In the minimum of 500 the price is $ .64 each. 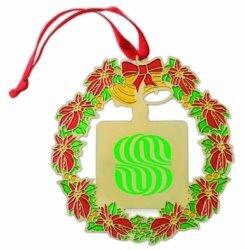 The upside down Santa Golf Club Cover fits most all sized clubs and in the minimum of 36 is $ 25.00 each. 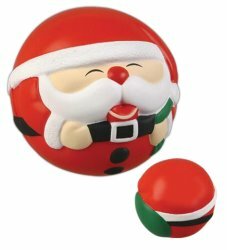 The 2 3/4" diameter Santa Claus stress Reliever provides an imprint area of 1 3/4" X 3/4". In the minimum custom imprintable quantity of 150 they are $ 1.81each. Available in either plush or felt. 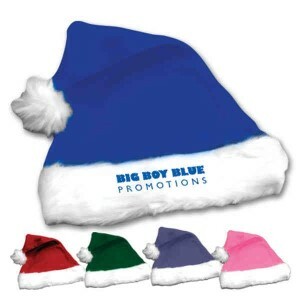 in Blue, Purple, Green and Pink these colored Santa Hats can be embroiderd or without a custom imprint. 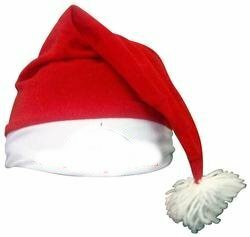 The felt Santa hats without a custom imprint in the 100 quantity are $ 2.38 each, for 250 the price is $ 2.27 each, for 500 the price is $ 2.15 each and for 1000 the price is $ 2.05 each. For pricing on the plush Santa hats please give us a call at 800 960-9080. The plush Caroloer Hat is a one size fits all hat. In the minimum of 18 they are $ 7.50 each. It is a non-imprintable hat. A favorite for kids and adults alike. 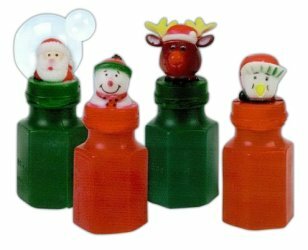 The Christmas bubbles are in a 2 oz. bottle and are sold only as a non-imprinted product, Minimum order is 250 and they are an amazingly $ low price of $ .60 each. 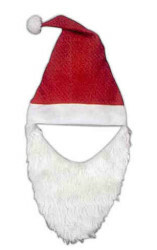 The Santa Beard, moustache and hat is a one size fits all and in the minimum of 18 they are $ 7.50 each. 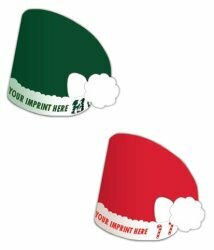 Our posterboard Santa and Elf hats are made of heavy density white posterboard and are liqui laminated for a high gloss finish. In the minimum of 250 with your one color imprint they are only $ .66 each. 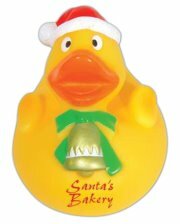 The 1 1/4" X 1 1/2" X 1 1/2" Rubber Duck Santa Ornament provides an imprint area of 5/8" X 5/16". In the minimum of 150 they are $ 1.50 each. 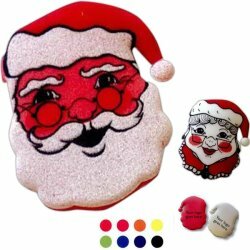 The foam f" X 8 1/4" X 3/4" Santa Claus and Mrs. Claus Bath Mitts are therma sealed and are great for bath time fun. They can have a custom imprint on the backside of 3 1/2" X 5". In the minimum of 100 they are $ 2.60 each. The Holiday Slider game is a EVA foam game for your table top. Take turns flipping the puck/ball into Santa's fireplace opening. It measures 4" X 4" and can be imprinted inon the net area of 2 3/4" X 1", the post side areas of 2" X 1/4" or the puck in an area of 3/4" X 1/2". In the minimum imprintable quantity of 100 they are only $ 2.11 each. Left picture is the 16" Plush Stocking in the minimum quantity of 72 is $ 3.54 each and on the right is the 15" Plush Stocking and in the minimum of 72 is $ 8.64 each. 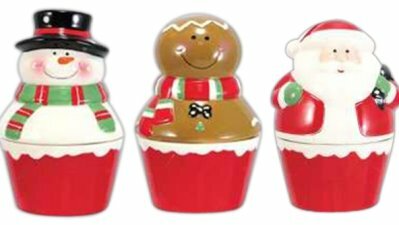 The 3 1/4" X 5" hand-painted ceramic mini cookie jars fit on a cupcake bottom. Each one is filled with 1 oz. of Black and White fresh cupcake cookies. In the minimum of 24 they are $ 6.58 each. Not imprintable. The 15" USA or Military Camouflage Cotton Holiday Stockings can be embroidered or screen printed on the cuff. Minimum quantity is only 25 and in that quantity they are $ 7.50 each. The minimum imprintable quantity on the Holiday emery boards is 3000 and they are $ .28 each.. Please call us at 800 960-9080 for larger quantity pricing. Pictured below are four sizes of mesh stockings that we have available for quick shipping. The 8 inch size in the minimum of 200 is $.42 each, the 12 inch size in the minimum of 200 is $ .54 each, the 16 inch in the minimum of 200 is $ .74 each and the 18 inch in the minimum of 200 is $ .80 each. The picture on the right is the Header that is availaable for the stockings. The 8 inch size in the minimum of 200 is $ .12 each, the 12 inch in the minimum quantity of 200 is $ .16 each, the 16 inch in the minimum of 200 is $ .19 each and the 18 inch in the minimum of 200 is $ .215 each. 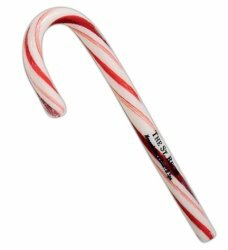 Th inflatable 4 1/4" X 18" Candy Canes in the minimum of 250 are $ 1.39 each. The Vinyl Stockings are available in sizes of 8 inch with a 250 minimum and a price of $ ..32 each and for the larger 15 inch Stocking the price in the minimum of 250 is $ .41each. 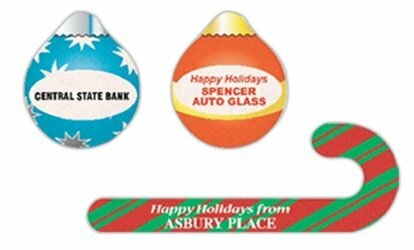 Here are three great pens, Holiday Candle, Tree and Candy Cane for the Holidays that can have your message on the barrel. In the minimum quantity of 250 they are $ 1.49 each which includes your imprint on the barrel. There also is a set-up charge of $ 45. 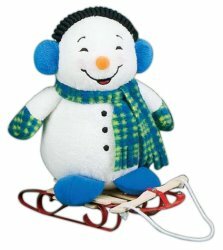 The foam Reindeer Walk-A-Pet with a minimum of 100 can be imprinted with your special message and the price is $ 3.58 each. The foam Reindeer Antlers has a minimum quantity of only 100 and the price with your custom imprint is $ 1.67 each. Please note that if these items are to be imprinted there also is a plate charge of $ 45. 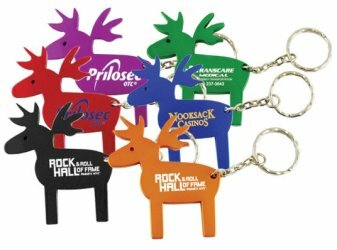 The 2 1/8" X 2 1/2" aluminium Reindeer shaped key chains are sure to be a hit for all ages. 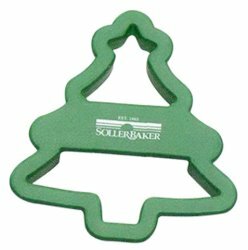 They provide an imprint area of 1" X 5/8" and in the minimum of 250 are only $ .99 each. With a minimum quantity of 250 the Holiday Coloring Books have 16 pages of Holiday related pages to color. They are priced at $ .66 each in the quantity of 250 and your imprint can appear in the 7" wide X 1.75 " high. On the left we have the Holiday Fun coloring book the middle picture is the Night Before Christmas and on far right is the Make Winter & Holidays Safe coloring book. The 7" Musical Snowman plays Frosty the Snowman when is belly is squeezed. Sold only as a non imprinted product. In the minimum of 36 they are $ 7.42 each. 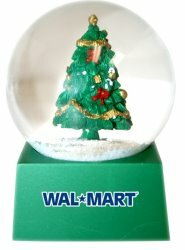 Just shake the 2 1/2" Christmas Tree Snow Globe and watch it snow!. It provides an imprint area of 1 1/2" X 3/4" on its base. In the minimum imprintable quantity of 100 they are $ 5.99 each. The 3 1/4" X 5 1/2" hand painted crystal reindeer ornament provides a custom imprint area of 5/8" X 1/2". In the minimum of 35 they are $ 10.99 each. 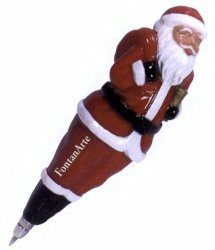 The Santa Claus pen measures 5" X 1 1/2" X 1 1/2" and provides an imprint on Santa's trousars of 1/2" X 3/8". In the minimprintable order of 50 they are $ 4.80 each. 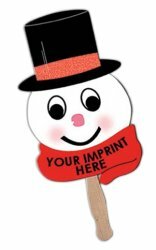 Each of these decorative 8 1/2" X 6 7.8" Snowman high density posterboard fans can be custom imprinted and are only $ .99 each in the minimum of 250. Pictured below is a stock " Night Before Christmas" cookie. 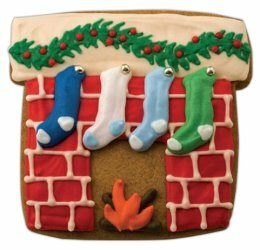 Minimum order on stock cookieis 100 and they are $ 6.58 each. For information on other stock designs or custom cookies please give us a call. 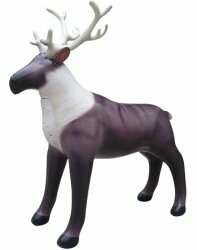 You will find superb quality in our 7 foot inflatable reindeer. In the minimum quantity of three they are $ 335 each.